Five months ago, Justin joined Maple Valley as a bottler and production assistant. 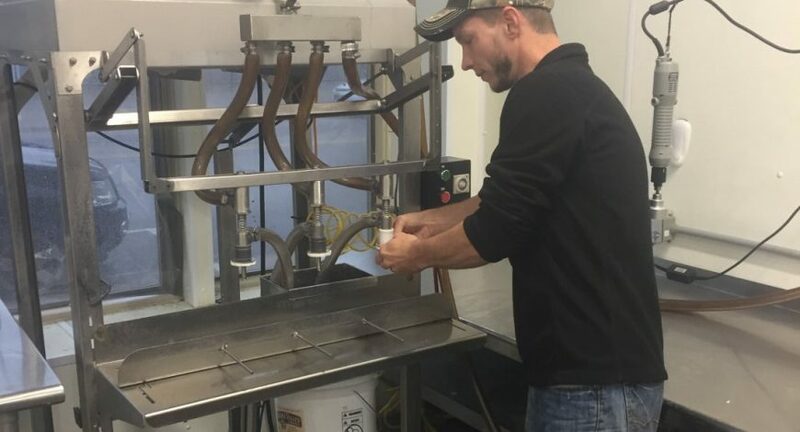 It is a role that calls for a certain level of artistry, as our bottler must ensure that syrup is selected to match the color and quality standards for our two grades of syrup. It is also a balancing act that requires multitasking skills and an ability to plan according to timing and product demand. Since starting , Justin has met these challenges with ease. 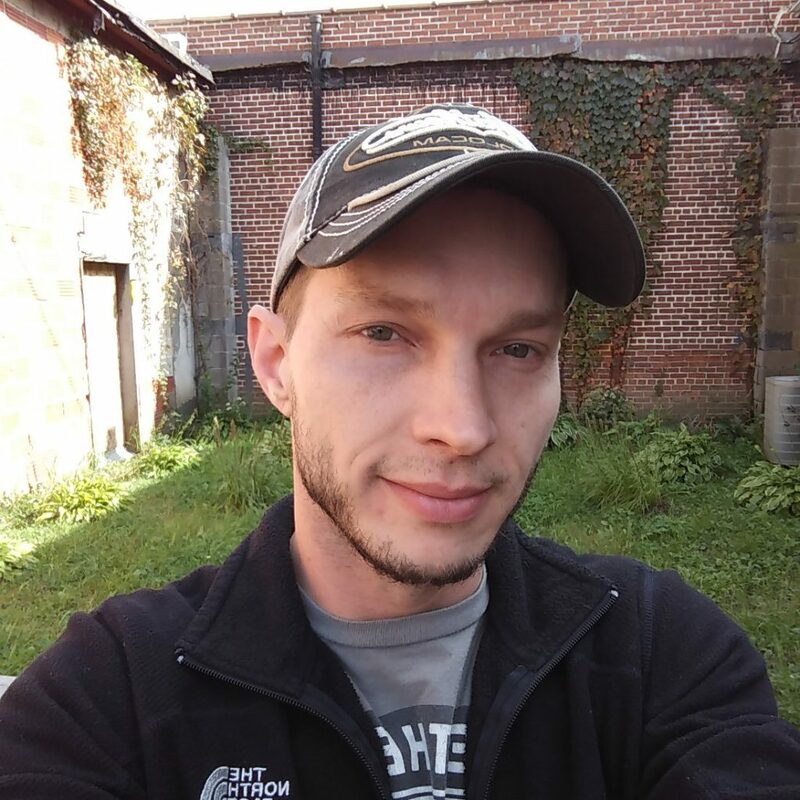 Below, find out what lead him to join the cooperative team and how his role is evolving. Justin first saw the job posting for Production Assistant posted on Indeed. He had been a stay at home dad to his two little girls for the past 6 months, but he was ready to return to the workforce. Having lived in Cashton for about a year after getting married and moving to the area, he was looking for a local job. The posting at Maple Valley caught his eye with its proximity to his home. It held his attention because of how well it matched with his work experience. He had previously worked for several organic companies and had even made sugar syrup in the past. As he was expecting to interview for a part-time position, Justin was surprised when he was told at his interview that he might be preferred for a full time bottling position based on his experience. He was very excited. When he was hired on, General Manager Renee told him she wanted him to make the bottling room his own and, one day, become the bottling room manager. He was thrilled at the opportunity! There is no such thing as a typical day of work for a production assistant / bottler. Typically, Monday requires planning to adjust the production schedule and decide what is needed to be bottled for the week. Once a decision is made, barrels of syrup are hand selected from the cooperative’s stock based on color and flavor. When it is time to bottle, the barrels are heated and mixed in a large stainless steel vat. The bottler checks the quality of the syrup again at this point, carefully evaluating color, flavor, & brix level (sugar content). 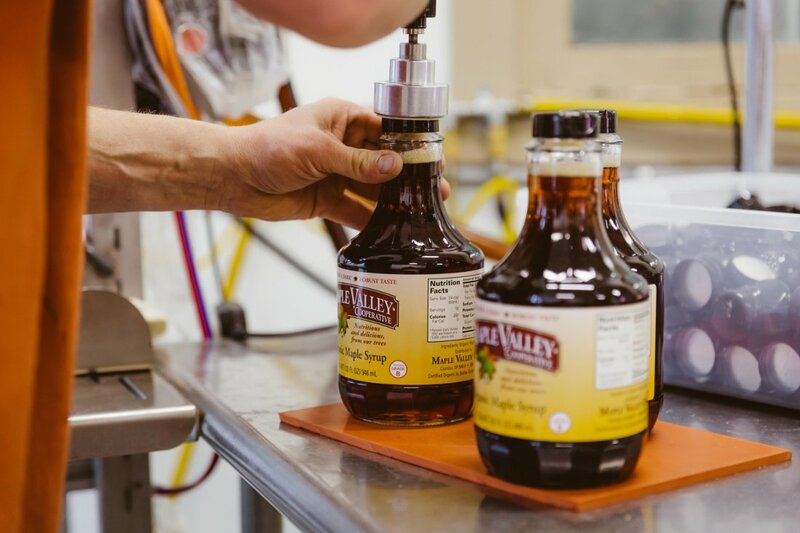 Once determined to reach quality standards, the syrup is pumped into a bottling vat. Along the way, it is heated again and sent through a filter press. Finally it is bottled. 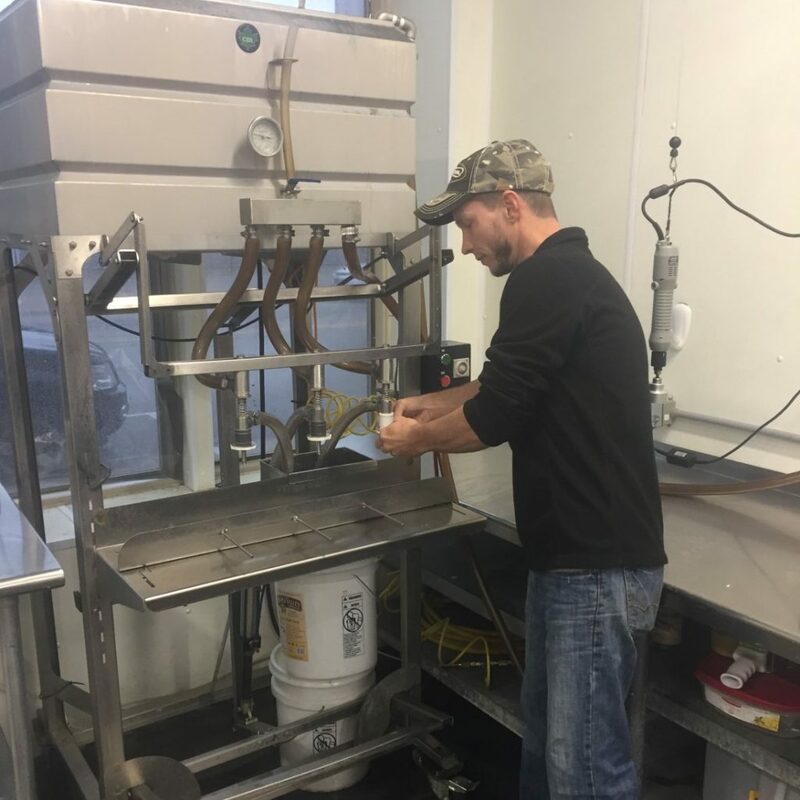 The whole process takes approximately nine hours and usually involves the processing of around three hundred gallons of syrup. On days that he is not bottling, Justin has a variety of other responsibilities. These include preparing shipments, building pallets, maintenance & construction projects, loading pallets onto trucks, warehouse organization, and cleaning. He has also been in the process of increasing his planning and administrative duties by helping with inventory, talking to carriers, and building SOPs. And, like everyone here at the cooperative, he sometimes takes on projects that don’t directly relate to his regular responsibilities. Justin hopes he can use his past production experience to inform positive changes in the bottling room. A full revamp has already begun with re-arranging for efficiency & plans to replace some of the older pieces. He hopes to one day be able to automate as much of the process as possible. With luck, he believes this could double the production in a day’s work. When he’s not a work, Justin is typically spending time with his family. He also enjoys working in the garden and playing his guitar. His family practices an organic lifestyle which he defines as eating healthy, being conscious of the environment, and living daily life with family, community, and the world’s well being in mind.